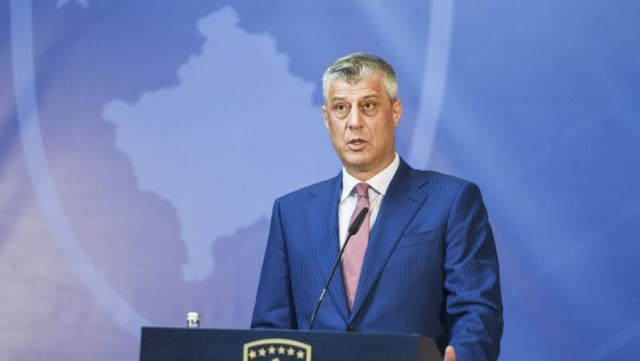 Kosovo President Hashim Thaci spoke again of the possibility - as he said - of the border correction with Serbia during the upcoming dialogue process. Thaci made these comments after his visit to Kosovo Chamber of Commerce. He said that representatives of the municipalities of Presevo, Bujanovac and Medvedja expressed their willingness for the Presevo Valley to join Kosovo, so according to him, if there is dialogue compatibility, this region could join the Kosovo. "We have about 400 kilometers of the border with Serbia that should be marked and without the demarcation with Serbia can not be concluded the process of state formation and consolidation," said Thaci. "For this reason will be discussed about the demarcation, the correction of borders and within the framework of border correction, under no circumstances, for any price can not be imposed the realization of the Serb aspiration for the partition of Kosovo. Meanwhile, I think it is very feasible, acceptable to us, the institutionalized demand of the representatives of the Presheva Valley to join Kosovo," said President Thaci. "If there is mutual agreement (in dialogue with Serbia), no one would go against a bilateral agreement, neither from the European Union, nor from the US or NATO," Thaci said. According to him, "there will take place the border correction but not the partition of Kosovo". He said he expects from the end of August and the beginning of September the dialogue to be dynamized under the assistence of the European Union and with the support of the United States of America.